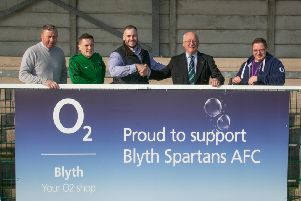 Blyth Spartans manager Tom Wade and players Matty Wade, Robbie Dale with Sam Wrightson. Blyth Spartans have acknowledged the courage and determination of a young Blyth boy who was involved in a terrible accident. Ten-year-old Sam Wrightson was knocked over by a car a couple of weeks ago as he was heading home from Horton Grange First School in Cowpen Road. He had to be resuscitated seven times before he was rushed to hospital with serious head injuries including a fractured skull, a broken cheek bone, broken nose and a chest injury. Blyth boss Tom Wade along with players Matthew Wade and Robbie Dale visited Sam and his family to present him with a signed Spartans shirt. “Sam is doing really well now,” said his mam Sarah. “He’s still off school and he hates it. Plus he loves football but can’t play football again for Blyth Rangers for another five months, so it’s very frustrating for him. The signed shirt was donated by the Spartans Supporters Club.